In 1979, ‘Mike The Bike’ Hailwood swung his leg over a Ducati 900 NCR and won the Isle of Man TT. 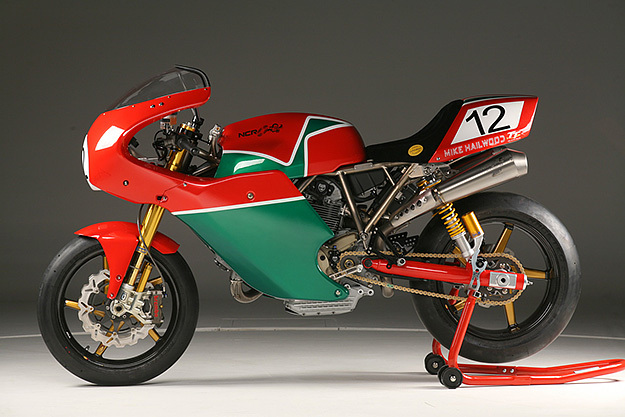 It was a legendary performance, and NCR has honored the 30th anniversary by producing a stunning replica based on the Ducati Sport 1000. This superlight racer weighs just 136kg, with the titanium frame accounting for only 5kg (11lbs) of that. The exhaust system is also titanium, while the bodywork and wheels are carbon fiber. Power comes from a new NCR 1120cc race engine producing 130hp, over 40hp more than Hailwood’s race-winning machine. Just twelve of these replicas will be built, at a cost of €100,000 ($136,000) each, and they were delivered during the 2009 Isle of Man TT festival.